Although effectively managing your income and expenditure is one of the most basic skills required for life, most people have had no education or discipleship on this vital subject from home, school or church. Mastering Your Money is one of the most important elements involved in maintaining viable marriages and homes where parents raise stable families. Whether married or single, learning to budget with intelligence and discipline is the key for turning dreams about home ownership and living a life of generosity into a reality. Mastering Your Money is also one of the most potent discipleship areas for engaging with God and growing in trust and obedience. This program gives biblical insight and practical how-to application. Studies have shown that 80% of those getting help from churches in financial management become part of the worshipping community. A program designed to provide people with a sound approach to financial management. Teacher and as a Pastor. Introducing the first steps to financial control. between obligations, needs and wants. to align our financial management and goals with our responsibilities at our stage in life. Learning to create a "seed bag". The seed bag can prove to be one of the most dynamic areas of your budget. Learning how to manage well when income is predictable, and when income is not predictable. opportunities, looking beyond just the now, and continue the journey of financial mastery and life transformation. 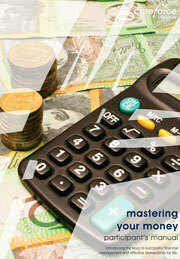 Learn how to manage your budget, decrease expenses and increase income.